The Martin County Fair site, which was located where the Five Lakes Shopping Centre is now, was sold in 1964. 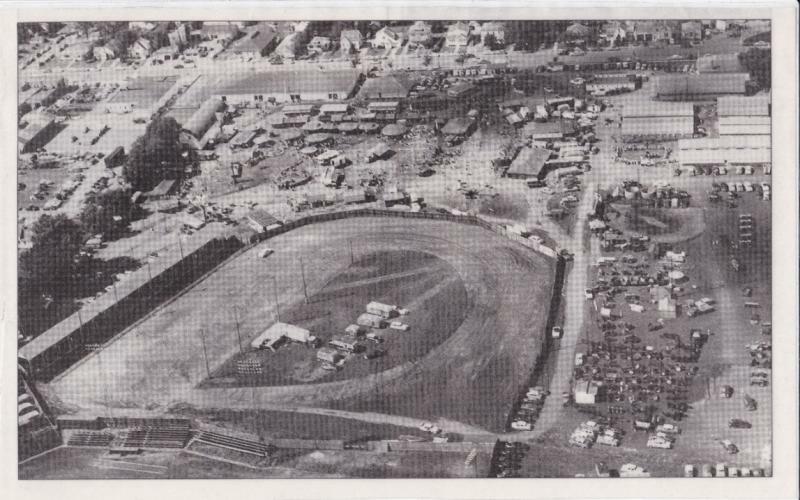 That fall under the direction of fair board president Harry K. Jorgensen, work began west of town on a new Fair site which included a 1/2 mile high banked race track. Work progressed in 1965 and the first event held was a demolition derby on July 4th. A 5,000 seat grandstand was purchased from Metropolitan Stadium and was completed just before the start of the 100th Martin County Fair. On Friday August 20th the new facility was dedicated and with George Trimbo from St. Peter as the promoter, Fairmont Speedway held its first Modified race. On that very first night Marv DeWall from Jackson shattered the Minnesota state record for a 1/2 mile dirt track by more than a full second. The Speedway held a second fair race on Sunday night and followed that up with a race held in September. 1966 became the first full season of weekly racing on Sunday nights. In 1968 the Speedway switched to Friday nights and added the Sportsman division which quickly became very popular. The races were very well attended in those days especially during the fair where the fans packed the grandstand to witness the new pace car give away. 1971 brought another change as the Modifieds were replaced by Late Models. 1972 saw the races being held on Wednesday nights and in 1973 the switch to Saturday nights. The change back to Friday night racing came in 1976 and over the years it has switched back and forth between Friday and Saturday nights. In 1984 the name was changed to Fairmont Raceway and for awhile in the late 80's it was called Fairmont International Raceway. In 2000 a new aluminum grandstand was constructed. Over the years different classes of cars have been added or dropped with as many as six classes running some years. This has allowed many racers to start racing at a lower level and progress to the higher levels. Racing runs in the blood and it is apparent as many generations of family members have graced the track over the 50 years. Currently Fairmont Raceway is an IMCA sanctioned track and is known as the fastest 1/2 mile track in the Midwest. There are five classes that race weekly: Sport Compact, Hobby Stock, Sport Modified, Stock Car, and Modified. Special races are also scheduled to feature Sprint Cars, Late Models, and the USMTS Modifieds. The car counts average in the mid- nineties, which makes it one of the top tracks in IMCA racing. The Fairmont Raceway crew consist of 40 staff and volunteers who strive to provide an excellent racing and fan experience each and every race night. The current track record for 1 lap was set 8-21-15 by Australian Ian Madsen who wheeled a 410 Sprint Car around Fairmont's big 1/2 mile in 14.224 for an average speed of 126.4 miles per hour. This is similar to a bumper sticker that was popular in the 60's.